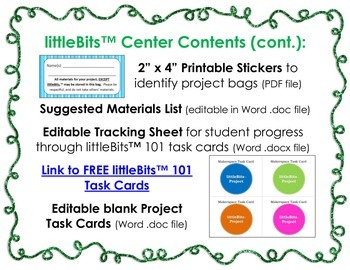 Makerspace Centers and Projects BUNDLE! Elementary and Middle School Makerspace BUNDLE! Want your students to develop problem solving and critical thinking skills while having fun and being creative? Start a makerspace! A makerspace (also called a maker space, hackerspace or fab lab) is where students can create, think, problem-solve and have fun. To get an idea of what that can look like in a library or school, watch this littleBits™introduction video or look up Maker Faire on YouTube. After watching a few of the videos, you’ll get an idea of what the movement is about. 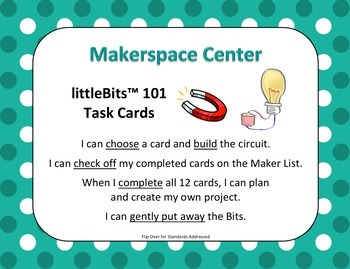 This product is for using littleBits™ electronic circuit kits as part of a library center or classroom center to experiment with electricity and circuits, as well as to create something new with electronics inside it. 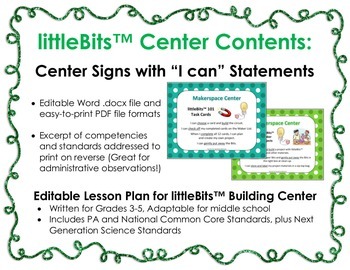 ALL FILES ARE EDITABLE in Microsoft Word (.doc or .docx file formats) unless otherwise noted as as PDF file only. 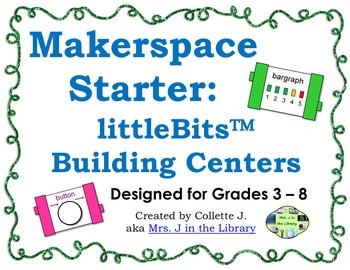 If you aren’t sure about whether or not a makerspace is right for your library, school, or classroom, I recommend downloading the preview and reading my makerspace blog posts for more information. Follow me on TpT to get email updates about my store, new products, and sales!